Plus receive up to $100 onboard credit per stateroom. * Save up to $1,800 per stateroom ($900 per person) is based on a per person discount off applicable launch fares on a space available basis at time of booking on select (insert voyage/trade here) sailings. Launch fares are offering fares and may not have been in effect for the past 90 days or resulted in actual sales in all categories. Intermediate discounts may have been taken and fares may remain at discounted levels after this promotion. Fares are based on minimum lead-in category on Ruby Princess 5/18/2012, Crown Princess 5/24/2012, Emerald Princess 5/23/2012, Caribbean Princess 5/14/2012 and Diamond Princess 2/27/2012 sailings on a space-available basis at time of booking. Fares for other categories may vary. Oceanview stateroom may have an obstructed view. 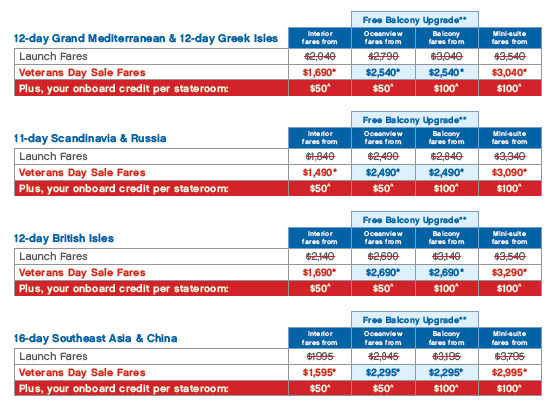 Fares are per person, non-air, cruise-only, based on double occupancy and apply to the first two passengers in a stateroom. These fares do not apply to singles or third/fourth-berth passengers. Government fees and taxes of up to $155 per person are additional and subject to change. Princess reserves the right to impose a fuel supplement of up to $9 per person per day on all passengers if the NYMEX oil price exceeds $70 per barrel, even if fares have been paid in full. This offer is capacity controlled and may not be combinable with any other public, group or past passenger discount, including shipboard credits. Offer is available to residents of the 50 United States, Canada, Puerto Rico, Mexico and the District of Columbia who are 21 years of age or older and receive this offer. Fares quoted in U.S. dollars. Please refer to the applicable Princess Cruises brochure or princess.com for terms, conditions and definitions that apply to all bookings. Reference promotion code: R6Y. Offer expires: November 14, 2011 at 11:59 p.m. PST. © 2011 Princess Cruises. Ships of Bermudan registry.